‏”I'm only two coffees away from going grouse hunting now, so it will be a fine one indeed," read in an email from Gry Elisabeth Mortensen, adding she hoped my weekend would be nice as well. I admit I had to turn to Google to find out what grouse hunting is. While finishing my salad in sunny Hampstead, I thought to myself her world couldn’t be more different from mine. As a veggie I’m not fond of seal hunting, but slightly aware of the damage done in Greenland by people like me. I was curious to get to know more about two young documentary makers, Gry and Trude Berge Ottersen, that have made a film called Sealers – One Last Hunt. The film is brilliant, well made in every aspect, beautifully shot and has a strong character. Why seal hunting? How did you get the idea for the documentary? Trude Berge Ottersen: It started in 2010. I was then a vegetarian and got to know some young seal hunters, and through their enthusiasm for their profession and narrative capacity for the subject my fascination became aroused. I knew nothing from before, only that I was against seal hunting – I had even signed a petition. But based on what? Because of people like me they were now losing their culture, a 300 years long tradition was coming to an end – because of an undeserved bad reputation outside of Norway. When I brought the topic to the pitch for most people, I realized that even Norwegians were not enlightened when it came to modern sealing. And then it dawned on me that meat-eaters – who gladly swallows chicken – were opposed sealing, and that EU in 2007 banned all seal-products based on the fact that seals are to cute to kill. I then realized that I had a film to make. But who should be the characters? The young seal hunters told countless stories about this characteristic figure, who clearly was the king of seal-hunting. In January 2014 I finally met captain Bjørne. His whole identity was stained and built up around sealing – who was he without it? I understood at once that this mythical man, with 45 years in the Polar Ice, was the perfect character. I came along on a research -trip spring 2014, and then I met Espen – a young mate and a fifth generation seal-hunter. He was so proud, and had an aura that caught my attention, a mystique which I figured was going to be challenging but interesting. The final main-character, the rookie, was chosen so the audience could get to know seal-hunting through the eyes for a newcomer. Gry Elisabeth Mortensen: The two of us are pretty different in the sense that Trude comes from the inland and was a vegetarian, while I come from an island in Arctic Norway so living of what the sea can offer has always just been normal to me. Whale and codfish was the food that I grew up with. But still, the seal hunt is very very special, an expedition where you stay in the dangerous West Ice for two months. And the crew works tremendously hard for little money. What was it like, being aboard the vessel for two months? GEM: The shooting of this film was the two best months of my life, because we lived in the nature and had nothing else to think about. No phone line, no internet, nothing except the making of the film, the weather, the light, the ice conditions, the animals, the people. And we could go for weeks without having a shower, walking around in bloody, woollen underwear all day long. Haha, a perfect environment to keep focused. TBO: Seal hunting is about so much more than killing animals. It’s a rich heritage with much knowledge and traditions – with many inherent values we unfortunately are on track to lose in today’s modern society. Respect for traditions, our ancestors, energy-use and most importantly, understand how it all fits together. Living in harmony with nature and a holistic worldview. Today we can buy everything in the store, but we can not buy culture and history. I see the importance of these elements for a man’s place in the world. The loss of seal hunting as an industry is loss of pride, knowledge, values, traditions and a rich cultural heritage. I had never been out at sea before, never been to Iceland or Greenland or the Polar Ice, never been hunting and never eaten seal – so I was embarking on many unknown tracks, experiencing new things every day. I learned an incredible amount about nature and animals, ice conditions and weather, words used at sea, sailor knots, butchering and everything that has to do with the different seal-species. Contrary to what most believe, there are barely more professional or gentle way to kill animals. The seals sleep/relax on the ice when they get a shot in the head, they are not applied stress, neither in terms of fear or transportation. To ensure that everything is done correctly, all ships bring along a veterinary-inspector. GEM: The seal hunters we made the film about are more concerned with animal welfare and the environment than most people I know. One of them usually works with dog sledding, one runs a horse farm and so on. They are very much the opposite of what many people imagine. You can see this for instance in the scene with the polar bear. The skipper can’t stand watching seals being hurt, so he goes after the polar bear to euthanize the pups that are harmed and left by the bear. The attention to details makes you feel closer to the characters. How did you decide your approach? We really wanted to make the audience feel like they are actually on an expedition through the West Ice. In image and sound, we try to make the audience feel the polar craving. I liked how the film was shot, for instance when the weather was bad, and the scenes on the ice. The music was very good as well. Talk to me about the cinematography, sound and music. We call the film an action documentary. Trude was the main cinematographer, and she really tried to make the bloody scenes ”edible”. To drip the blood slowly, rather than letting it splat right in your face. When it comes to the music, we started working with the composers (Jakop Janssønn and Ville Langfeldt) already in the development. We ended up with a mixture of americana, Norwegian folk music and ”icy” kalimba. Humour plays a big part as well, scenes like when seal hunters imitate the famous scene from Titanic, and where one of them was checking if the knife’s blade was sharp enough by shaving his leg, made me giggle. Did you decide beforehand to try and catch scenes like that, or did that just happen? Thank you, that is a huge compliment to us! There was so much humour on board. Our challenge was rather, in the edit, to leave out all the jokes that were too internal. The skipper has a very distinct way of expressing himself. He is like a polar ice poet. Even when one of the guys got a rare and dangerous disease in his hand, the crew was making loads of jokes about it. What kinds of weapons he should use to shoot his hand off and so on. Including humour is natural to us. We also laugh so much when we work. We think there should be more humour in documentaries in general, even those dealing with the most serious of topics. We are trained in anthropological filmmaking at the University of Tromsø. So our films are mainly observational. But we are not puritarians in any way. Is Koko Films working on something new? Yes. 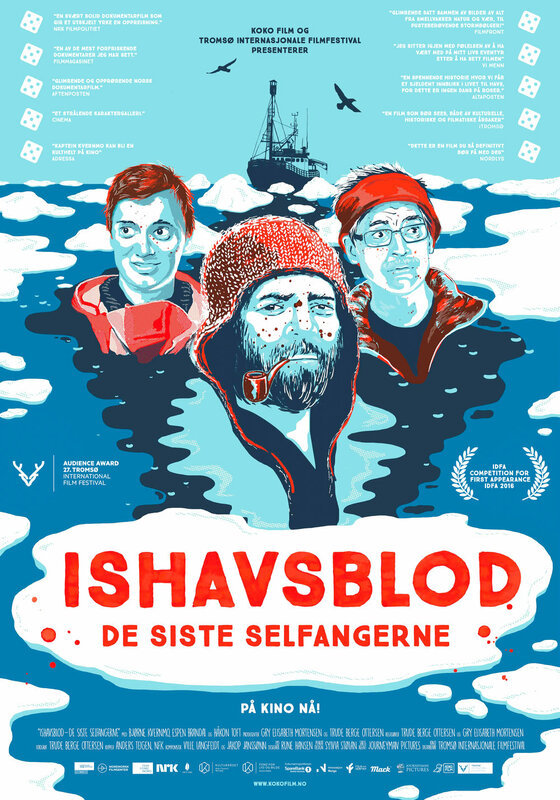 A film about five grown up brothers who live together on a farm on an island in Northern Norway. We have worked on this film for 4 years, and hope it will be done in 2018. Ocean, ice and bitter cold in a seemingly untouched corner of the world. A crew who can only trust each other in the kingdom of polar bears and sudden storms. Until now this has been an annual ritual for the obstinate, ageing skipper Bjørne and his first mate Espen. In the beginning of the 20th century, more than 200 Norwegian sealing vessels were active, now there’s only one ship left. Massive international condemnation and the EU ban on all imports of seal products has almost wiped out the industry. But the skipper and his first mate refuse to give in. With a motley crew of greenhorns and old-timers, they set out on the dangerous journey into the polar ice. They are the last seal hunters of Norway.